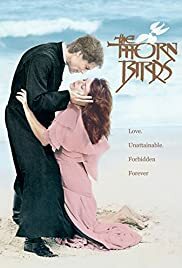 How many episodes of The Thorn Birds have you seen? Young Meggie Cleary: Oh Father. I'm so glad I'm not dying. What would I ever do without you? Ralph de Bricassart: Oh silly. You'll never be without me. The greatest romantic mini-series of all time! Richard Chamberlain became an even bigger heartthrob with the advent of this epic mini-series, Rachel Ward became a star, and Barbara Stanwyk made a major comeback and stole the show in only three hours of on-screen time. "The Thorn Birds", based on Colleen McCullough's best-selling epic novel takes place in the Australia of the 1920's and stretches across three generations to the 1960's and tells the story of a life-long romance between an ambitious priest (Chamberlain) and the woman who only wanted his love. Rachel Ward is a beautiful rose as Meggie, Richard Chamberlain is an ideal Ralph de Bricassart and Barbara Stanwyk is at her best as Mary Carson, Meggie's aunt, the richest yet loneliest woman in Australia. She desires Ralph for herself but he easily spurns her and she takes revenge on him with unmerciful vengeance. He had broken his vow of obedience prior to meeting Mary Carson and she sets out to cause him to break his other vows of poverty and especially chastity. When she dies suddenly she leaves her entire estate to the Church in Rome with Ralph in soul charge as overseer (vow of poverty now broken). She also knows that sooner or later he will hopelessly succumb to Meggie's wish of receiving his love. Several years pass before that vow is broken but it eventually is and what comes of it is a deep, dark secret that will either make or break Ralph. The entire supporting cast is brilliant also: Barbara Stanwyk, Richard Kiley and Jean Simmons all won an Emmy for their performances. Piper Laurie, Christopher Plummer and Bryan Brown were all nominated but poor, little Rachel Ward and Mare Winningham got the shaft. See it! It's a full, rich story with powerful stamina!